Before I begin the real blog post for today, I want to give a huge shout-out and kudos to those who blog on a regular basis. I am in awe of you and admire you. I could list a million excuses as to why my posts are so sporadic, but the truth is I follow blogs whose authors work full-time, or have health issues, or even work a second job. So, basically, I have no excuses. My hat is off to you consistent bloggers. Bravo! Thank you for being an example and my inspiration. I aspire to emulate you. 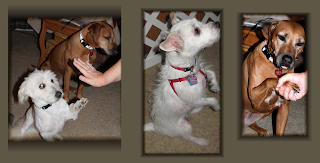 The last weekend in August, me and my furbabies packed up and headed south. We had the wonderful pleasure of spending the weekend with Susan and Angel of What's Up with Susan and Company. 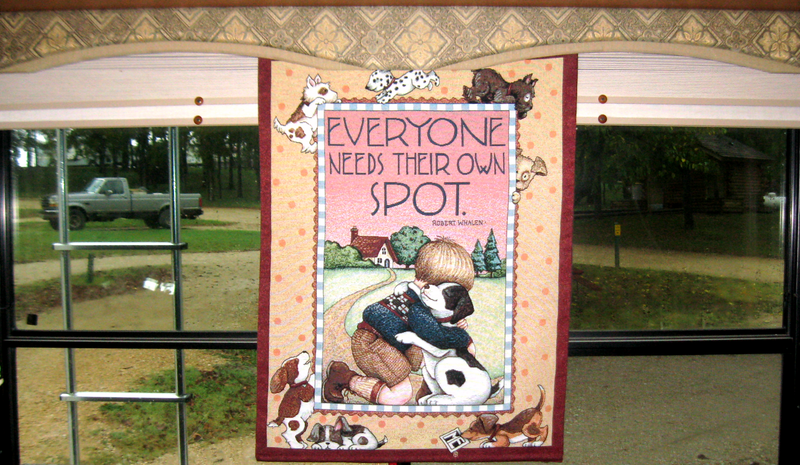 She blogs about her "spots" and has that adorable sign pictured above hanging in her rear window. How cute is that?!? Susan has a 5th wheel and is one of the courageous women whose blogs I follow that travel the country on their own timeline doing whatever they want to do, whenever. Susan is currently workamping in Texas and it was a thrill to spend time with her in person. Thank you Susan and Angel for so graciously opening your home to us! And what a home it is! You can tell from my pictures that nothing is lacking in Susan's spot. Her trailer is luxurious! I was in heaven spending the weekend in an RV, in an RV park, among fellow RV folk. Heaven on earth. Bentley, Nonni and I arrived Friday evening. Susan showed me some of the ins-and-outs of RV living - such as emptying tanks, checking levels, etc. I had asked her to save all that for when we arrived so I could learn. She has it down to a fine art, and gave me many wonderful tips. Thank you Susan! She had to work in the general store on Saturday so me and the furbabies just hung out. I opened the curtains and basked in RV living. It didn't even matter to me that it was raining! And Nonni and Bentley managed to find a few spots of their own. Bentley was born for RV living and travel. I just hope he gets to experience heaven on earth in our very own RV. I think he loves it as much as I do! And it wouldn't be an introductory weekend without each of them showing off their tricks. Notice Nonni's expression of "Oh no. Not again." And then her tongue action as she concentrates to not be out done. LOL. Bentley doing his High-Five. Angel can sit like this forever - Amazing! Nonni's big paw handshake. Saturday, after Susan got off work, we went to a nearby catfish restaurant, Denton's Catfish Cay. Wow. Was it ever good food! If you're ever near West, Texas, I highly recommend stopping in. It may not look like much from the outside, but I promise you won't be disappointed. @ Ann - Yes, we had a great time. RV = fun! :) YOU are one of the people I SO admire! You work, you craft, you sell your crafts, you teach, you share, you "mommy" - human and Duke. You blog. In short, YOU rock! 10/22/12 - Happy ONE YEAR Anniversary!